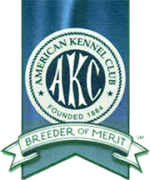 Selectively breeding for outstanding temperment, adhering to breed standard and maintaining the hunting instinct of this wonderful breed. Please check with us for both show and pet quality puppies available and thank you for visiting our site and getting to know Aerden Setters! Cooper (CH Aerden's Talk of the Town OM3 UDX JH) is invited to NOC - AKC National Obedience Championship - for the second year in a row! Birch (Aerden's Queen of the Snows) wins Best Puppy at the ESAA National Specialty! Puppies have arrived. 3 girls and 2 boys. See our puppy page for more details!